Better Data Centers. Better Technology. Better Outcomes. NVIDIA DGX Systems deliver unmatched performance, and ScaleMatrix’ DDC enhanced Data Centers are specifically designed to protect this critical investment while ensuring maximum compute performance, around the clock. ScaleMatrix sites are compliance audited, ultra-secure, hyper-efficient data centers outfitted with advanced capabilities which guarantee airflow and temperature management for workloads beyond 50kW per equipment cabinet. With multiple data center locations, a full hybrid service offering, and 24/7/365 U.S. based, enhanced remote hands support, ScaleMatrix is an ideal partner for demanding AI, deep learning, and high-density compute customers. ScaleMatrix’ technological advancements help clients deliver better results through exacting Data Center environmental management! Ship to any of our five U.S. sites and our Enhance Remote Hands teams will rack and stack equipment to your specification. Each new NVIDIA client will receive a premium burstable bandwidth connection with 10Mbps included at no additional cost. Enjoy one month free for any AWS, Google, Azure or data center interconnect services through our SDN partner, Megaport! With more high-density data centers than any other U.S. provider, ScaleMatrix Data Centers provide the ultimate in variable density hosting. With clean-room quality environmental control, guaranteed airflow management, and industry-leading PUE, ScaleMatrix offers aggressive pricing in a variety of key markets. Dynamic Density Control™ cabinet technology at all ScaleMatrix sites support 52kW of power density in each 45U cabinet. DDC delivers unmatched supply-side airflow management, closed-loop thermal cooling, and clean-room quality air at the rack level. 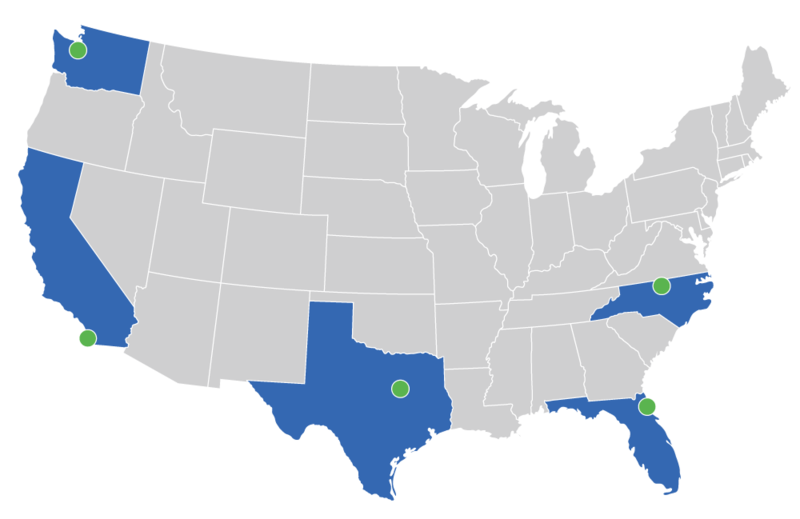 Multiple data center locations include Southern California, Washington, Texas, North Carolina and Florida. Our DDC-enabled data centers ensure IT hardware can run at peak performance at all times, without concerns for power, cooling, or resource limitation. Server hardware performs better at ScaleMatrix data centers due to ideal thermal conditions and last longer with fewer failures from dust, debris, and thermal variation – creating better ROI! Unparalleled security at the cabinet level with biometric cabinet access, video security, and physical security checkpoints throughout our data centers. "A Cloud for the Artificial Mind: This Data Center is Designed for Deep Learning"
"ScaleMatrix Builds Niche Solution in HPC for Genomics and AI"